The seven Rainbow Fairies are missing! Rachel and Kirsty search for one in each RAINBOW MAGIC book. Read all seven books to help rescue the fairies and bring the sparkle back to Fairyland! Fairyland is home to seven colorful sisters. Together, they are the Rainbow Fairies! They keep Fairyland dazzling and bright. But when evil Jack Frost sends them far away, the sisters are in big trouble. If they don't return soon, Fairyland is doomed to be gray forever! 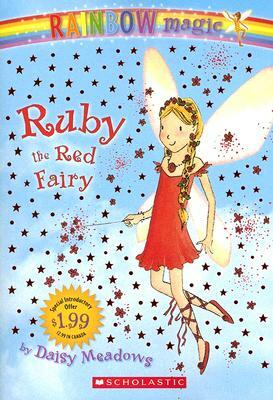 Rachel and Kirsty discover Ruby the Red Fairy in the pot at the end of the rainbow. Can they help find the rest of her Rainbow sisters . . . before it's too late?